Books, books, books! 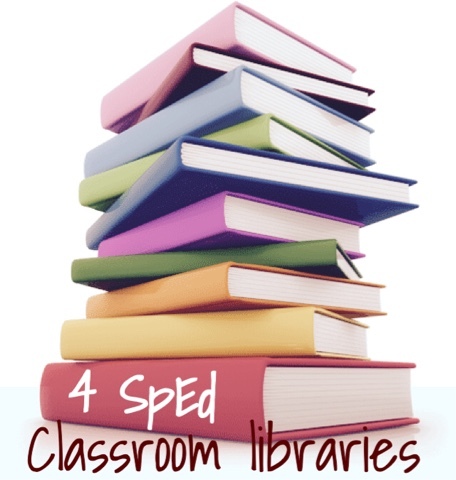 What does your special education library look like? How do you keep your books organized? I asked these questions on instagram this week and these awesome special education teachers showed us their libraries and I absolutely love all of their great ideas and organization!! Check out how many purposes this area serves! I love how the bookshelves on the left have pictures to organize the books too! The struggle of trying to be organized! I feel you Miss Mini Mills (but I have to admit, you look quite organized. The labels and the book bins are awesome!). I love the laundry basket seating idea! I think it's important for kids to have comfy (and cool) places to read. In my classroom, the kids thought it was fun to just sit on a rug instead of in a desk. Whatever works! This is a great space-saving idea as well. If you kids can't handle a bookshelf (or if you don't have room for one), put your books in bins and take them out as needed. So smart! I loved seeing all of these great ideas! I love using adapted books in my classroom. Read about how I adapt books and grab free downloads here. What does your classroom library look like? I'd love to hear about it (or see it). Thanks so much for featuring my library! Love all the other libraries too! Thank you for the wonderful ideas! I'm actually a mom of a special ed student in 7th grade, and I've volunteered to undertake the responsibility to level and organize my kid's class library. I have absolutely no experience in leveling books though, but love organizing in general! Any tips?